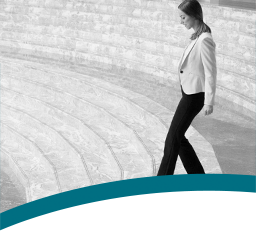 As a garment importer, you know how difficult it can be to manage the quality of your products, while ensuring your suppliers in Asia meet acceptable standards for social compliance. The question is, where can you turn to for a professional QC presence to report on the status and quality of your goods as well as the conditions at your supplier’s factory? 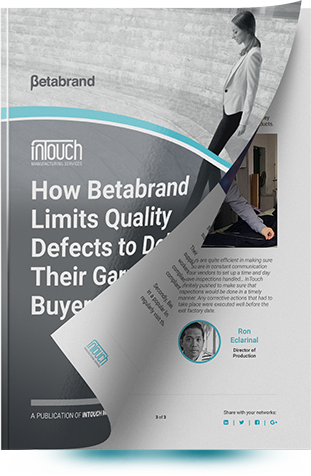 Download your FREE copy of InTouch’s case study: How Betabrand Limits Quality Defects To Delight Their Garment Buyers and discover how a third-party QC partner helped Betabrand overcome their biggest manufacturing and QC challenges in Asia. Needing to understand the conditions of their Asian supplier's facility, Betabrand wanted assistance in verifying that their supplier adhered to local law and responsible sourcing standards. The clothing retailer faced a genuine concern for the quality of one of their most popular products. In response, they needed trained experts to regularly visit their supplier and report on any quality problems or other issues so they could address these with their supplier before shipping. Betabrand sought a QC service provider that was able to not only inspect their products, but also audit their Asian suppliers too. Management at Betabrand considered swift and detailed reporting essential to addressing any issues quickly without delaying shipping. With the help of compliance audits, Betabrand was able to accurately screen suppliers and avoid potential compliance problems. Working with experienced garment inspection staff to establish quality standards had a direct impact in lowering their defect rates in final products being shipped. This led to increased customer satisfaction and fewer product returns. Manufacturing in Asia almost always comes with challenges. A reliable QC partner may be as beneficial to your product as it was to Betabrand’s. If you're ready to find out more about Betabrand's story and what you can learn from their experience, just fill in the form on this page and click "DOWNLOAD NOW" to request your FREE case study direct to your email inbox!